The best way to travel Japan is to join a tour especially if you are a first time visitor. No I can’t find a perfect one covers all places where I want to see. Understand. How about you make your own mini tour after the tour. One of the keys how you travel economical way is find a inexpensive transportation, right? There are many passes not widely known. 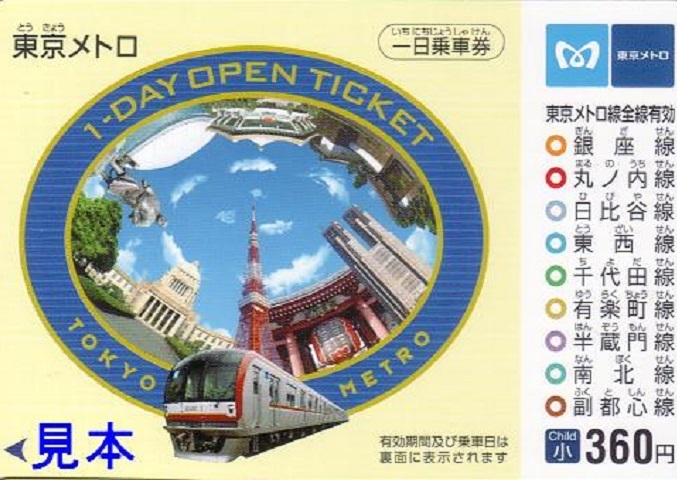 Tokyo Metro 1-Day Open Ticket price 710 yen it can be purchased on the day of use or in advance. Good for one day for all Tokyo Metro lines which cover most of Tokyo metropolitan areas. If you use airport limousine bus from Narita airport you can get even for free! How? At the airport ask the clerk for a combination of limousine + Metro 2 day pass. It costs you 6, 000 yen and includes a round trip limousine bus coupons plus 2 day Metro pass. One way limousine bus coupon itself costs you 3, 000 yen. Eventually you can get 2 day Metro pass for free. In Osaka Enjoy Eco Card is useful price 800 yen this is a special one day unlimited pass valid for Osaka Municipal subway, buses and trams. Also admission fees will be discounted with the pass at approximately 30 sightseeing spots. Good deal? Other passes : Yokohama City 1-Day pass, Hakone Free Pass, Kintetsu Rail Pass, Surutto Kansai 2-day and 3-day pass, Hiroshima and Miyajima economical tickets.